Across the bottom of the Speedify Dashboard are a number of panes that you can swipe through to learn more about how Speedify is helping your internet experience. This is a real-time graph of your internet usage whenever you are connected to a Speed Server. 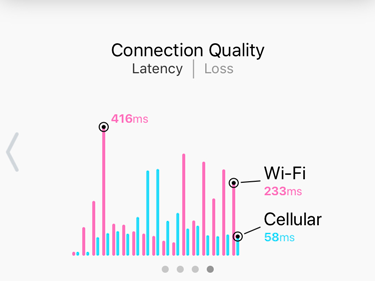 It shows each of your internet connections, and a grey line that represents the total data being transferred. 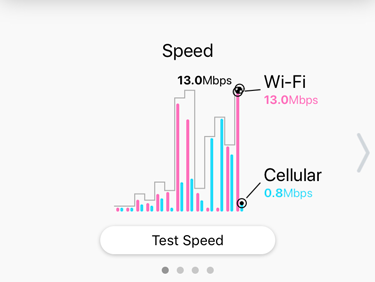 This will be higher than the solid bars if more than one connection is being bonded for increased bandwidth. How much has Speedify really increased your speed? Has it successfully saved downloads when Wi-Fi failed? This pane may take a few hours to fill in when you first start running Speedify. Downloads - How much was Speedify able to increase your download speed? Measured at peaks of activity. Uploads - How much was Speedify able to increase your upload speed? Measured at peaks of activity. 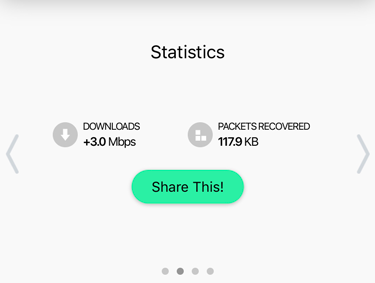 Packets Recovered - How much data was Speedify's error correction able to recover? All of this loss represents slow internet experiences that you didn't notice, failed downloads that succeeded, or calls that didn't hang up. 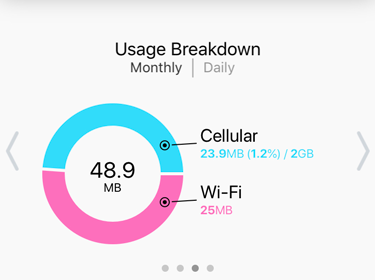 Shows monthly and daily usage for each connection. These values are based on times when Speedify is connected. Latency - The amount of time that it takes Speedify to send a small packet, round trip, over the connection. Smaller is better! Loss - Percentage of packets that have not been successfully delivered. Not only is smaller better here, but a good internet connection should almost always be 0%. That said, Speedify has a powerful error correction feature which can keep you online even when loss starts to climb.